Most of the AnandTech crew seems to be averse to putting cases on their phones for a variety of different reasons. I’m still of the persuasion where I want a case for everything that I’m going to carry regularly both to prevent putting scratches and also have a resulting device form factor something that looks a bit different than the norm. 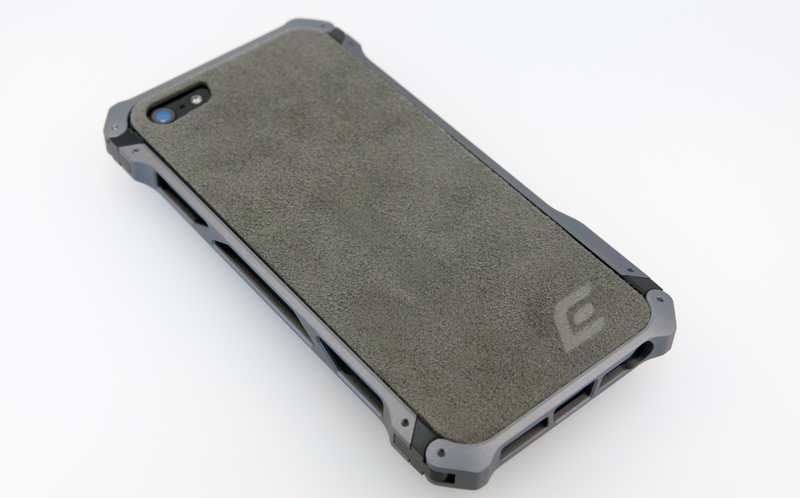 A few weeks after our iPhone 5 review posted, Element Case reached out to me and offered to sample a review unit of their upcoming iPhone 5 case, the aptly named Sector 5. 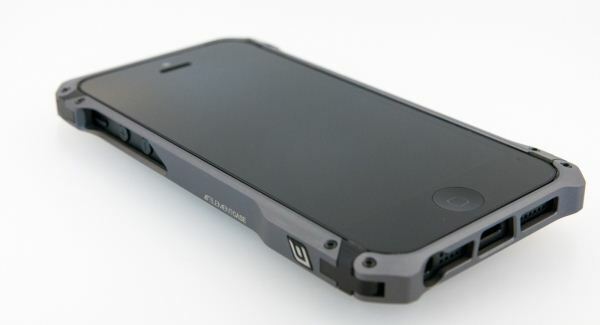 Element Case has been known for a while for making exotic cases that use metal instead of plastic and look like nothing you’ll see others carrying around, so when I heard about the iPhone 5 version I jumped at the opportunity. In addition, since I spent a lot of time back in the iPhone 4 and 4S days doing attenuation testing, getting to the bottom of whether this unique case detunes the antenna was particularly intriguing. Inside the box is the case itself, a removable adhesive suede back cover, keychain mountable screw driver, a “transit EVA case” which is a hard pouch with zipper for the phone, and some rash guards for the aluminum side. For installation, Element Case wants you to apply removable sticker “rash guards” which essentially prevent the anodization from chipping off of the device. In theory these are great, but not totally necessary, as the case includes a soft rubber material around its inner perimeter to prevent aluminum from touching aluminum. 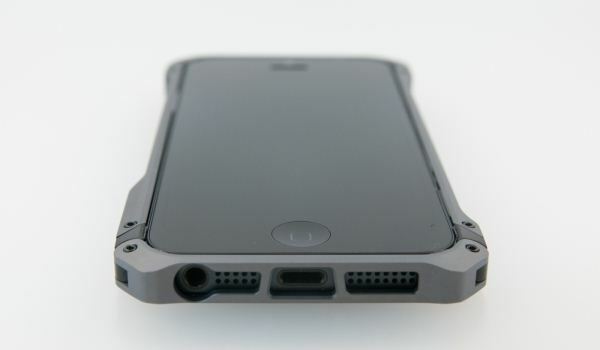 The Sector 5 wraps around the iPhone 5 and then screws together at top left to lock the phone in place. The supplied screwdriver is keychain mountable so that if you need to get your iPhone out of the case it’s handy. In practice there really shouldn’t be any need to take it out of the case unless you’re moving to a different one or have a stubborn docking station, since the SIM tray and other connectors are easily accessible on the device. 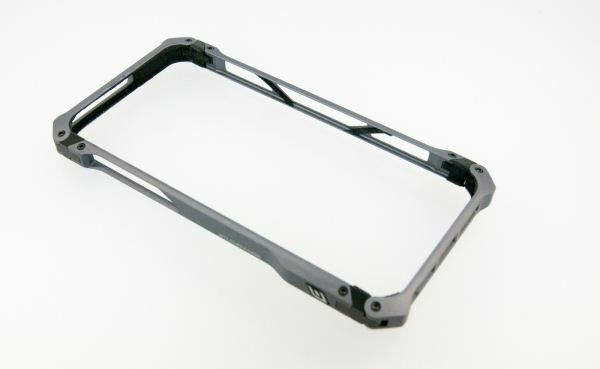 The Element Sector 5 is a completely different case than the norm, since, like I mentioned earlier, it’s made from 6061 aluminum instead of polycarbonate plastic, silicone, or some other polymer. This gives it a completely different in-hand feel than basically every other case on the market, one that’s eerily similar to the iPhone’s native aluminum characteristics. With the case on, the overall package is still surprisingly light since there’s a lot of material machined out of the sides. With the case installed, I measured a mass of 133.7 grams over the iPhone 5’s native 112 grams. For the back there’s an adhesive sticker which in my case was suede, though there are different back materials available. Having a suede backed device is something very different from what I’m used to, and surprisingly enough works well. I haven’t picked up a lot of dirt or grime leaving the phone backside down on surfaces, and the suede feels great. On the left side is a large cutout for accessing the vibration switch and volume buttons. They’re a little difficult to get to because of the depth of the machined groove, but still workable. At top is the power button, and beside it a groove where more material was machined out. I have no issues with the power button, it is still clicky and communicative. The right side has a cool cantilever looking structure with a large enough gap to get to the SIM tray and ejection port. I’m very grateful that Element Case chose to leave the SIM tray accessible since I’m constantly swapping SIMs, and making you take the whole case off to get to this would get old fast. At the bottom are cutouts for the microphone, speaker, earphone jack, and lightning connector. The Lightning connector is big enough for the standard Apple USB to Lightning cable, but not quite big enough for the Lightning to 30-pin or the Amazon Basics Lightning to USB cable, both of which required filing to make them fit. I’m not surprised by this however since it seems as though every Apple ecosystem case I come across requires filing to make all the accessories work. The earphone jack hasn’t been a problem with my Shure SE535 cable, thankfully. The aesthetics of the Sector 5 case are radical. You quite honestly are highly unlikely to run across someone with the same case on their iPhone 5, and as a result it’s always drawing attention when I have it on. I find the Sector 5 looks like something out of Quake rather than an iPhone case, with the aggressive geometric protrusions at the four corners, modern angular shape, and radical design. It’s definitely a bit crazy in the industrial design department as far as an iPhone case goes, but I’m a fan of how this makes the device look. In terms of feel, the Sector 5 is a bit sharp at times but also is easy to get a firm hand grip on, as the bulges at the four corners make it easy to grasp onto. The Sector 5 also doesn’t make the device much thicker than it is already as a result of its design. The tradeoff is that there’s not too much front display protection beyond the supplied screen protector (which I almost always refuse to install when supplied with cases), but there is a lip so that when laid front down the device isn’t totally coplanar with the surface it rests on. I’ve dropped the Sector 5 with the iPhone inside twice and was left only with a small deformity from the impact that is hardly visible, with no discoloration or scratching off of anodization. The case looks like it wouldn’t afford too much protection, but it does a good enough job at deflecting impacts on the sides or back; just avoid the front unless you’ve applied the screen protector. The big question is just how much adding an aluminum case to a smartphone affects antenna gain and cellular performance. I’ll note that I’m still using the case on a daily basis when using the iPhone 5, so the short of the matter is — not a whole lot, if at all. First, Element Case has included polymer links between each of the four main aluminum blocks so there’s no continuity between them, which is easy enough to verify with a multimeter. In addition the case is insulated from the aluminum exterior of the iPhone 5 with a rubber material, so there’s really no galvanic contact between case and phone. That’s a good first step to not change too much of the ground plane or inadvertently create a path between the bottom primary antenna and top secondary antenna on the iPhone 5. The iPhone 5 has an RFMD RF1102 tuning block and seems to do a good job dealing with any antenna detuning that the Sector 5 might introduce. I won’t say that the Sector 5 doesn’t affect the antennas at all, as adding conductors this close to the device clearly does, but the much improved tuning onboard the device seems to cope with it perfectly well and I haven’t noticed any ill effects. 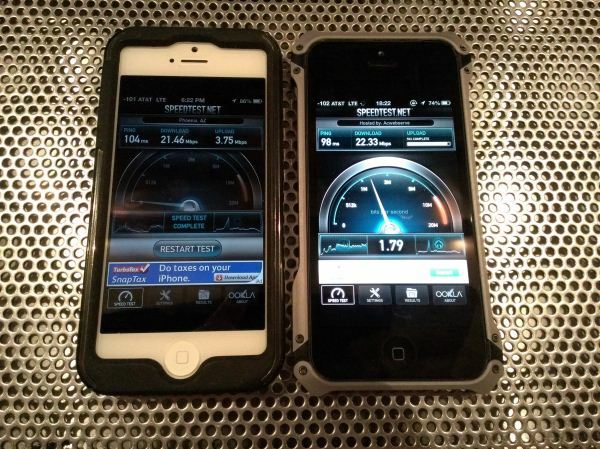 -101 dBm RSRP on the iPhone 5 with Incipio Dual Pro, -102 on iPhone 5 with Sector 5. I've done other testing where both were identical. I compared my iPhone 5 against a few others also on AT&T LTE (Band 17) and on AT&T WCDMA (Band 2 PCS) and didn’t notice any difference in RSRP or RSCP respectively after allowing the two to stabilize. I’m impressed that there really is no difference, and in using the device a lot with the case on I haven’t noticed any difference on my mental signal map. At $139.95 the Element Sector 5 definitely isn’t a normal case, nor one that’s in everybody’s price range, but if you’re looking for something that stands way out from the norm and has rugged construction I’d definitely recommend it. It's quite a head turner. you can get cases for 5$ on amazon. - screams "I need to be noticed !" I understand the need of ego-challenged males to show they're packing, but $140 seems very stiff for an ugly ego crutch that works less well than a $2 silicone case. Maybe I am just blind again, but I didn't see any mention of how well this case would protect against falls. It seems to me that it would be inferior to most cheap polymer cases in this regard since it cannot absorb the shock as easily as other cases. No, I've removed it probably 4 times to do a case swap and it hasn't left any residue at all on the back side. When you have a rubber or plastic case, and you drop the phone, the case can absorb a lot of the force of the impact by deforming. 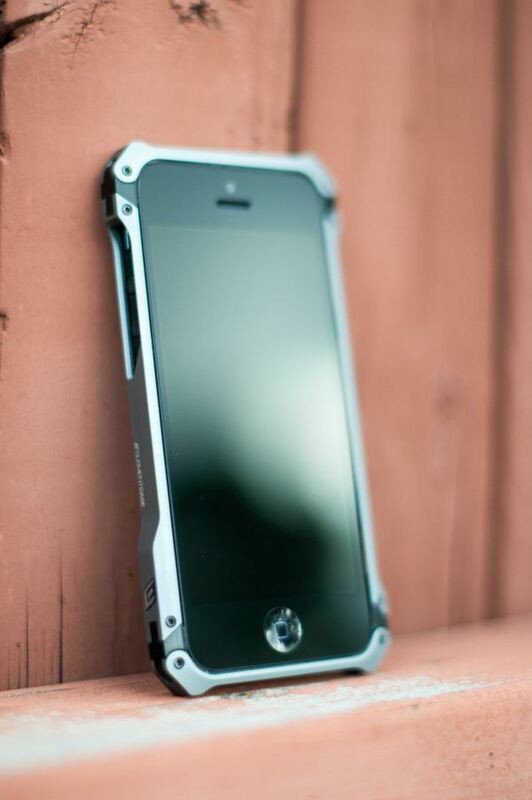 If you have a metal case, it will absorb none of the force, instead transmitting it all into the phone.